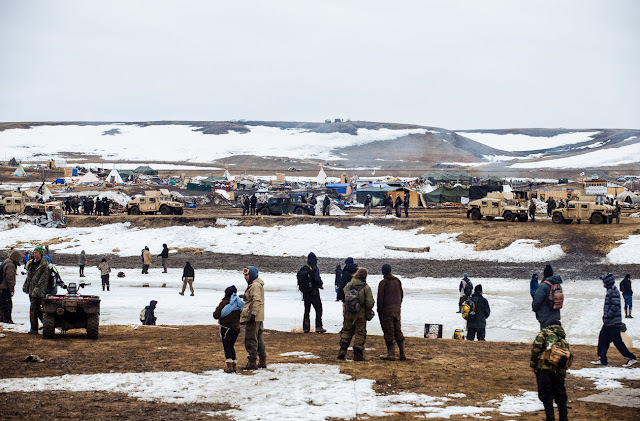 The Oceti Sakowin camp was the largest of several temporary camps on the northern edge of the Standing Rock Sioux Reservation in North Dakota. Protectors have been living on this land for months, in support of members of the Standing Rock Sioux. 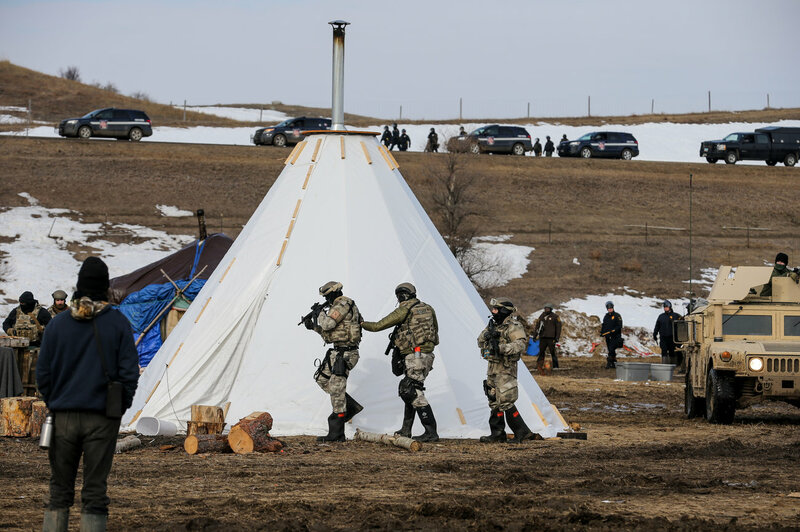 The North Dakota Joint Information Center reports that 46 people were arrested. 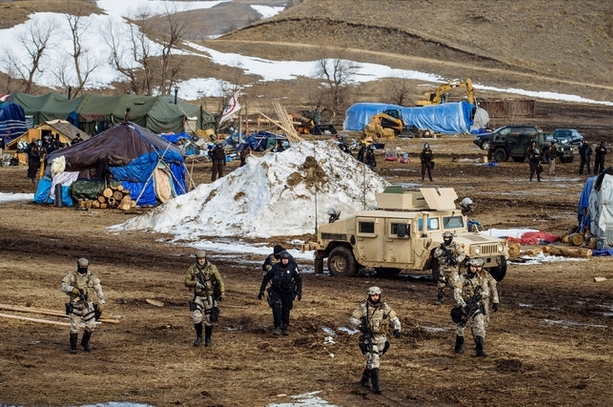 Others left the camp voluntarily throughout the day, according to a news release from the center. 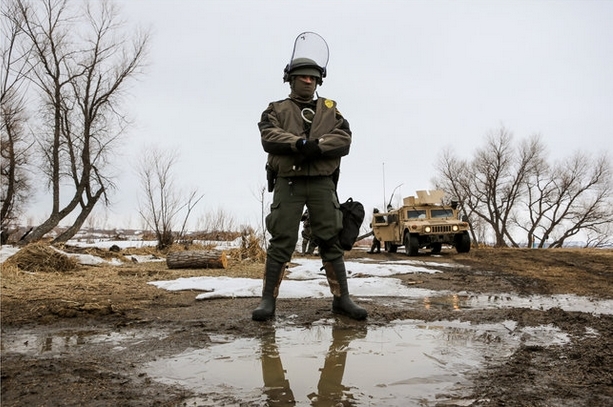 The eviction force was comprised of a variety of agencies including the Morton County Sheriff’s Department, North Dakota Highway Patrol, Bismarck Police Department, the North Dakota National Guard, Out-of-state law enforcement from the Wisconsin State Patrol (WSP) was also deployed under the Emergency Management Assistance Compact (EMAC). 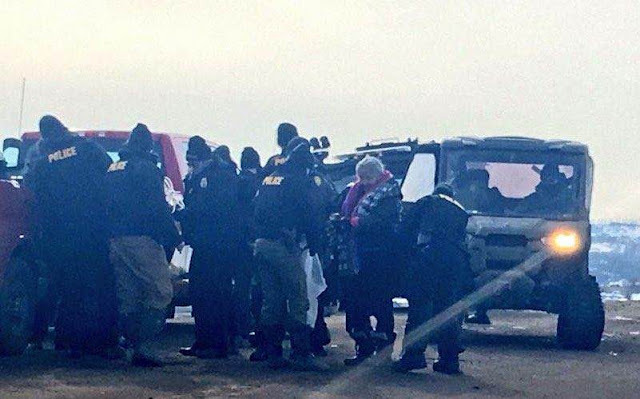 Several water protectors who remained in the camp were arrested. 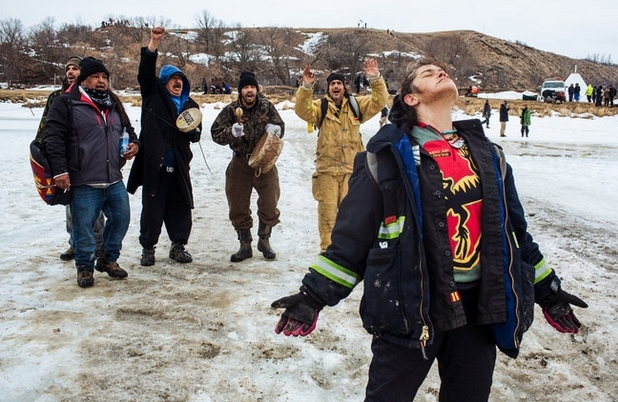 Some of the water protectors had been engaged in prayer at the time of arrest. 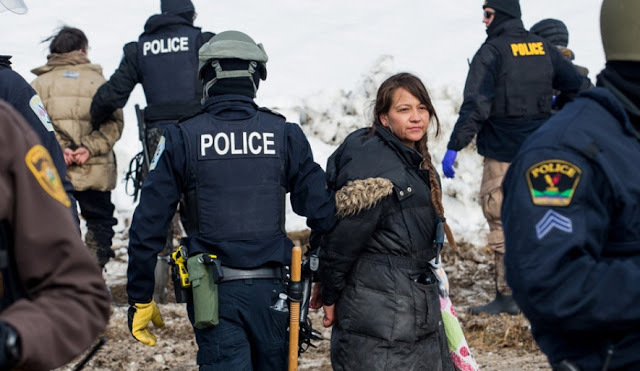 It was reported that other arrestees told the officers that they were violating treaties as they made arrests. 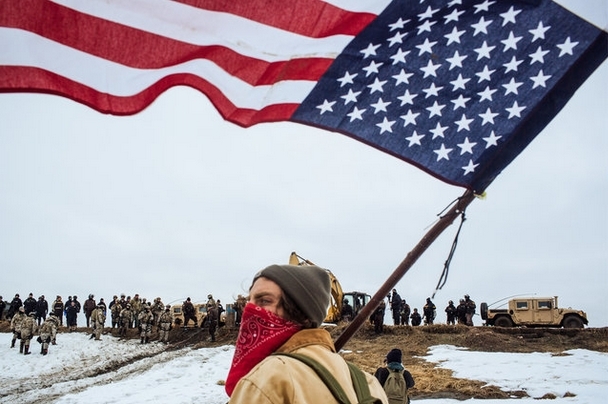 A group of veterans was also arrested while passively resisting. A separate force with utility terrain vehicles entered from the east. 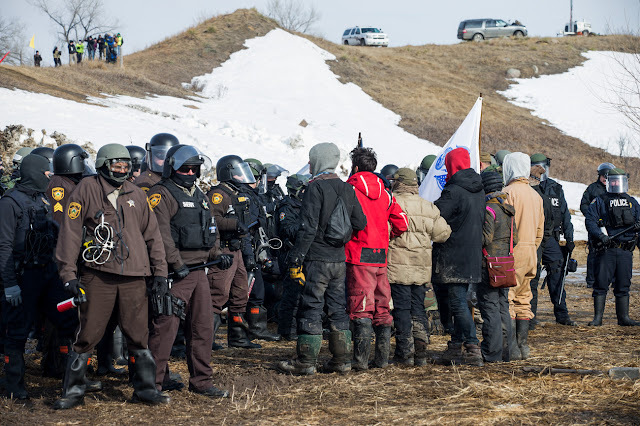 As on the previous day, North Dakota authorities arrested several journalists who were reporting on the scene. Independent journalists Ed Higgins and Christopher Francisco were both arrested while documenting the eviction. 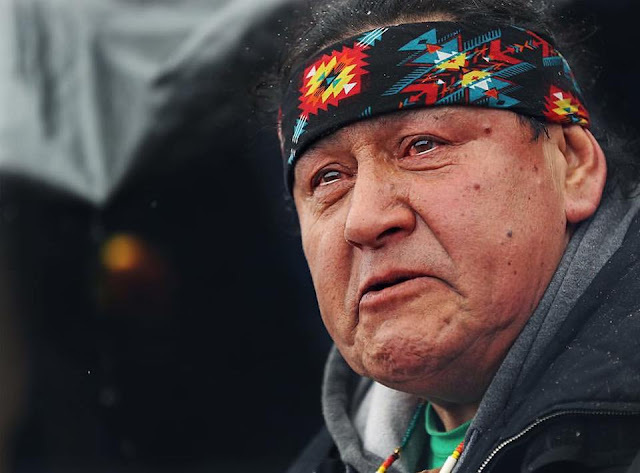 Cheyenne River Sioux Tribe Chairman Harold Frazier pledged that resistance to the DAPL pipeline would continue. The Old Ones say the Native American women will lead the healing among the tribes. Inside them are the powers of love and strength given by the Moon and the Earth. When everyone else gives up, it is the women who sings the songs of strength. She is the backbone of the people. 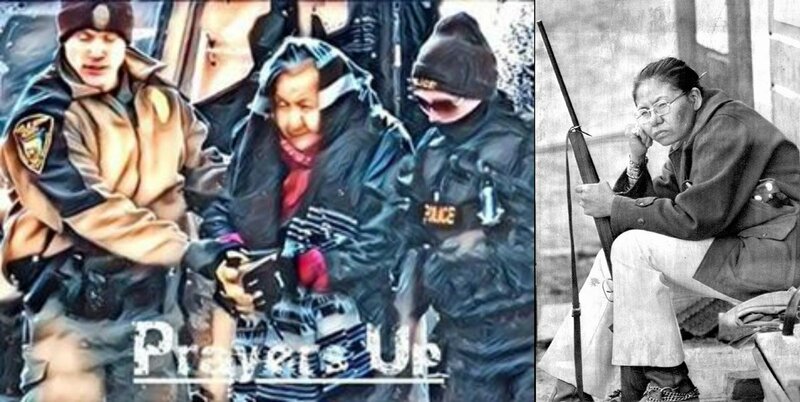 Responses to "Powerful Photos of the final hours at Standing Rock"
Why are the police dressed the way they are? What were they expecting, WWW3! It hurts me to see the elders taken away like criminals, our people yet again being oppressed, treaties broken and our people and lands desecrated yet again. It would do no good to fight, the police and army are only doing their jobs. Hurting them does not effect the monsters that let this happen , that signed the papers to take our rights and health away. Our right to protest will be taken away soon, along with the rest of our rights. We need to fight the way they do, with laws and loop holes, we need to learn the language of the snake with it's forked tongue. Start taking the fight to the courts and political system. and who owns the courts and political system?? The soldiers at the Nazi concentration camps were only doing their jobs. indigenous people often uphold the idea that a person is morally responsible for who they are, what they do and how they conduct themselves. The European system - built on the principle that the minimum amount of people can own everything their eye falls upon - that relegates everything to property - is built on a value system that uses force to apply a system that values nothing. That real, tangible things like earth or water or even the air can be traded for an artificial and fictitious commodity called money - a system that immediately creates deficiency and inequality as soon as it is applied. People say the court systems have been brought but as long as property truly is nine tenths of the law, indigenous peoples who will never uphold the belief that land can be owned, will always be disadvantaged and preyed upon by white society. 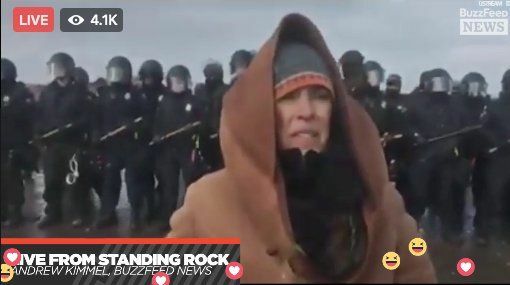 Police at Standing Rock are complicit by their actions. They are the strong right arm of a regime that seeks to commoditise the American people and are actively preventing Americans from reclaiming their national authority. And they do it for nickels and dimes in their bank accounts. And a good many of them know it. Thank you all for being true and strong. You have my greatest admiration and love and have inspired and comforted those who couldn't be there but were there in Spirit.